Preface. Introduction. FUNDAMENTALS. Structural features of soils. Structural features of rock. Influence of groundwater. Deformation concepts. Strength concepts. SOIL CLASSIFICATION. Object. Geological background. Classification according to composition. Classification according to geotechnical properties. Discontinuities and bedding. ROCK CLASSIFICATION. Rock identification. Rock mass. SOIL INVESTIGATIONS. Object. Penetration tests. Geophysical methods. Pore pressure measurements. Sampling. Determination of deformation properties. Determination of strength properties. Presentation. SPREAD FOUNDATIONS. Introduction. Induced pressure distribution. Bearing capacity. Settlements. DEEP FOUNDATIONS. Introduction. Piles. Bearing capacity of axially loaded single piles. Settlement of axially loaded single piles. Laterally loaded piles. Buckling of piles. Pile group behaviour. Piled rafts. Downdrag. Piers, caissons and underground walls. DYNAMICALLY LOADED FOUNDATIONS. Introduction. Linear vibration theory. Non-linear vibration theory. The subsoil as damped spring system. RETAINING STRUCTURES. Introduction. Earth pressure against retaining walls. Earth pressure against other structures. EMBANKMENTS AND FILL ON SOFT SOIL. Introduction. Loading berms. Settlement. Embankment piles. Enforced displacement or excavation of soft soil. Other means of stabilisation. SLOPE STABILITY. Introduction. Circular-cylindrical failure surface. Logarithmic failure surface. Composite failure surface. General aspects. EXCAVATION. Introduction. Dewatering. Unbraced excavations. Braced excavations. SOIL IMPROVEMENT. Introduction. Shallow compaction. Deep compaction. Preloading. Granular columns. Stabilisation by admixtures. Electrochemical stabilisation. Soil injection. Thermal improvement. Reinforced soil. ASPECTS OF GEOTECHNICAL DESIGN. Geomechanical views. Foundation requirements. International codes. References. Subject Index. The object of this book is to shed light on the most important design aspects encountered in foundation engineering and to present basic design principles representative of the developed part of the world. Modern geotechnical investigation methods and their interpretation are exemplified. The philosophy of the new European code for geotechnical design is presented. The most important and practical aspects of ground modification techniques are included. This book can be used as a textbook for senior undergraduate and graduate students. 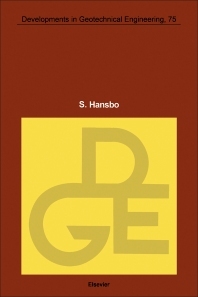 It can also serve as a combined text- and handbook for professional engineers working in the field of geotechnical engineering. Line drawings and photographs accompany the text.